Posts categorized "In the Media"
It was so much fun to have Q13 Fox at the factory this morning! Check out the video! The latest issue of PRINT magazine features an article, about Kelly Cline (local photographer), shooting images in our factory. The article includes photos of the photographer taking photos, very meta. Congratulations to Kelly for the super cool press, you are an awesome theonista evangelista ! There have been all kinds of great videos popping up on the intewebs & beyond lately. This one is on The Practical Guide to Healthier Living on the MSN health & fitness site. I'm not sure if you will be able to view this one if you aren't on facebook & a fan of PCC, but who doesn't want to be a fan of PCC?? AND our very own doctor chocolate (Andy McShea) was on King 5 Evening magazine last night. Find out what makes chocolate so decadently delicious! 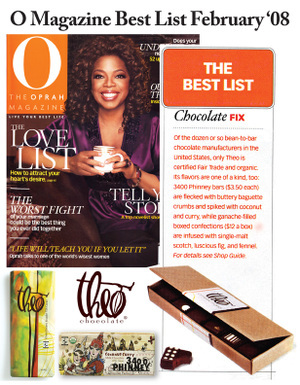 Theo Chocolate was included in a piece about Organic Valentine's on WUSA in the metro DC area. 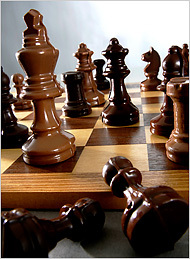 And, The Christian Science Monitor has a great post about fair trade certified chocolate. They interviewed Theo's own Debra Music for their article! We made the cover of the Seattle PI this morning! We are thrilled, delighted and very proud of Andy! 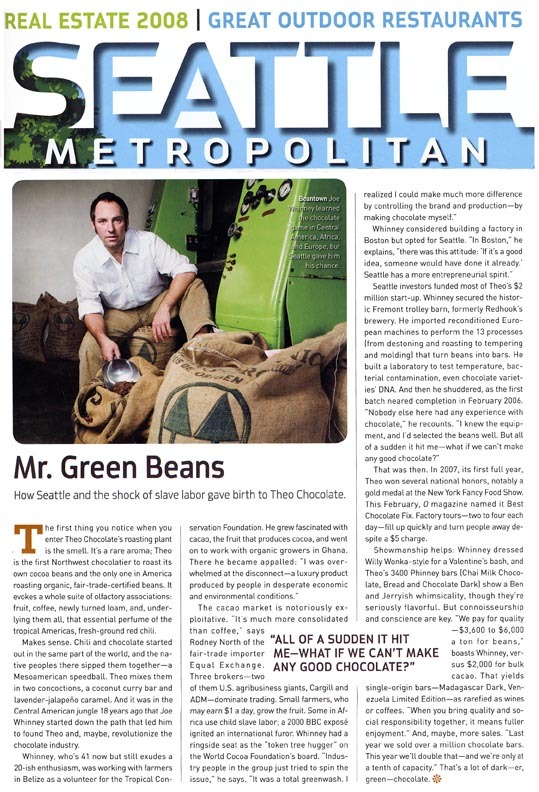 Tom Paulson also wrote another article about our founder Joe Whinney & Theo's fair trade practices: Theo hopes to start a cocoa revolution. Enjoy! 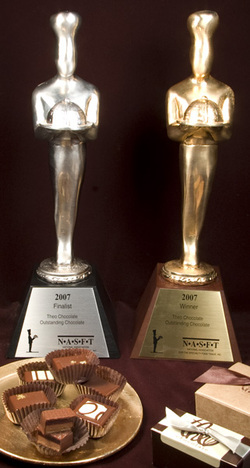 VOTE for YOUR favorite chocolate HERE! The Seattle Times ran an article on guided walking, foodie tours in Seattle, and Theo Chocolate is mentioned. I love the subheading of: "chocolate,sausages, and beer", you have my attention! If you were ever curious about the inspiration behind the label art of our Theo Origin Bars, Alissa over at Chocolate Surveyor interviewed our illustrator Zaara and asked her about her process. Go check it out! KOUW aired an interview yesterday afternoon with our founder Joe Whinney. Discription: Cocoa Beans Can Save The World Dave Beck visits Theo Chocolate in Fremont to talk with its founder, Joe Whinney, about Joe's passion for chocolate and travel. 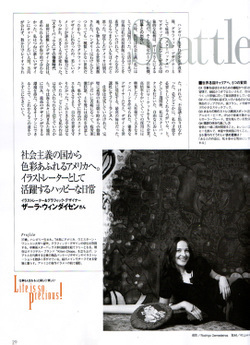 Our beloved illustrator Zarra, was featured in a Japanese publication called Precious. We have no idea what the article says, but Zarra is photographed in front of the beautiful mural that she created for us! Woo hoo! We are so excited to be Seattle's number one source for all things decadent and chocolatey! Thank you Thank you! 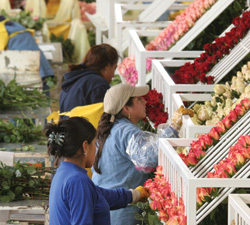 Check out this inspiring article from the Utne Reader on the lives of workers in the Fair Trade rose growing industry in Ecuador. I also found this more sobering article on the modern slave trade. Check us out in the Seattle Picks Newsletter! Dave Beck stopped by the factory for a tour and interviewed Theo founder Joe Whinney. Click here for a listen. KUOW is our friendly neighborhood NPR affiliate here in Seattle. Check us out here in the Seattle Dining Guide! A very nice and comprehensive piece about Theo. 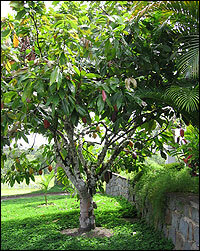 Here is a short but sweet fair trade chocolate posting from Plenty Magazine's Daily Green Bit. Mother's Day is just around the corner! 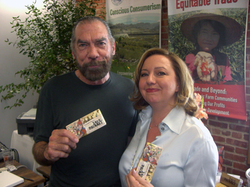 Tell Oprah's Producers you want to see Fair Trade Chocolate on the Show! Here is a link to submit story ideas to the Oprah Show. Child labor has been on my mind all week so that's what I'm submitting. Have your say the Oprah way. Please use your powers for good, not evil. Spamming Oprah is frowned upon. Here is a video clip from CW11 News in New York. It is a spot on Go Green Expo, which was this past weekend. Deb tells us the show was just packed, with five people deep waiting to get a taste of Theo Chocolate. It's nice to be popular! Meet Frankie! Frankie is looking for his forever home, andcame to visit the factory and get videotaped for his Wednesday's Child TV spot. Learn about Frankie and watch his video here. Frankie is well spoken and definitely loved the hands-on learning he did roasting cocoa with Nathan. We Theonistas wish him all speed in finding his new family! Theo Chocolate on the CBS Early Show "Eco Easter"
Here is a fun little Eco-Friendly Easter Spot from the CBS Early show this morning. You have to watch the whole thing to see the last bit where they skewer peeps as some kind of bizarre heathen sugar ritual. Not for the faint-of-heart. Tilth in the NY Times Top Ten! Check it out - Local kids make good! 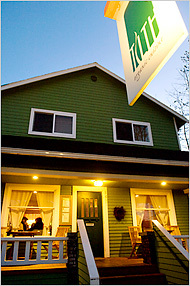 Tilth Restaurant gets reviewed in the New York Times - Excellent job guys! And Theo, of course, is thrilled to be the chosen chocolate of Tilth's signature Bourbon Hot Chocolate. Dee-lish! You can crib the recipe from their website here. 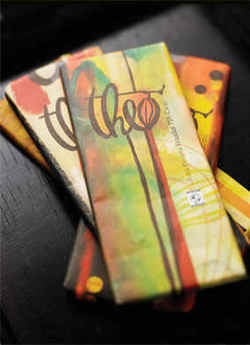 Theo Chocolate gets a lovely mention in the Seattle TImes. CEO Joe Whinney Speaks Out on Democracy Now! Check out this very interesting episode of Democracy Now! featuring Joe Whinney - "Chocolate's Bittersweet Economy": Cocoa Industry Accused of Greed, Neglect for Labor Practices in Ivory Coast; Theo Chocolate Founder, CEO Joe Whinney on Fair-Trade Cocoa. Check out this excellent article on ethical chocolate sourcing, featuring our own Joe Whinney. You can read more about the DNA mapping of our chocolate mentioned in the article here. Woohoo! Theo Chocolate on the Today Show! Can we be more excited? Check us out on the Today Show this morning!!! Simran Sethi is a total greenbabe. Awesome Theo mention in Seattle Times this weekend! Check out this lovely article which appeared in the Pacific NW section of the Seattle Times this weekend. Isn't it wonderful to live in such a sweet city? Not to mention the Coffee and Microbrews.... I LOVE SEATTLE! First Sight Productions - Theo Montage. Another Theonista video. We feel so popular! Hairnets are smexxxy! Wine and Chocolate is Smexxy! And Komo's Julien Perry tells us that The Tasting room is ready to smexx you up with tarty tidbits of deliciousness - "We offer a great little artisan cheese plate, we do Salumi cured meats and we do Theo chocolate confections. So, enough of the good food groups!" 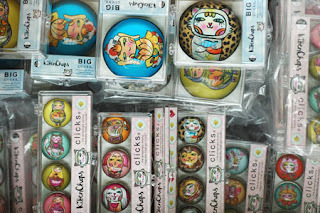 Check out Love #1 and Love #2 for fellow Theonista-at-heart Zaara of Kittenchops, who designs all our lovely packaging. Yay Zaara! Here is her blog- where you can see some interesting things she is up to! Kathy Casey shares some Theo love in her article in Seattle Times Newspaper on Haute Hot Chocolate. Theo Chocolate - The Movie! Our very own Laura J put this together for our holiday party last night. How much fun is this? It's like a tour in a box. We got a great mention for our factory tour in The Seattle Times today. I can't think of a better way to entertain the whole family over the holidays. Please do make sure you call in advance for reservations if you visit, and there will be additional tours during the holidays to accommodate as many visitors as possible. See you there! We got a lovely review of our Phinney bars on Candy Addict today! Candy Addict » Candy Review: Theo’s 3400 Phinney Bars. We met so many lovely people at the Chocolate Show this year, it's just amazing to me. Hilarious and accurate - Yelp gives us a nice mention on their Lazy Person's Gift Guide. I Love it! And check out special Yelp event - Drunk Shopping in Ballard this Friday night. So wrong, it must be right. We are so proud to announce our gold SOFI from the NASFT Fancy Food Show this year! It is especially an honor as such a young company to receive recognition among our peers. A nice little spot on Komo Radio's Go Eat! segment. This photo makes me hungry! Do you know your Theo Flavors? That's Peanut Butter & Jelly, Peanut Butter, and Ginger in the back row, and Ivory Coast and Mint up front. 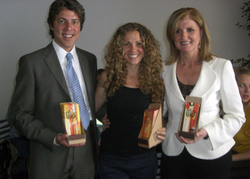 Theo recognized at the 2007 Food Network Awards Seattle-PI roots us on.